Ask the child to identify each piece of fruit. Place the pieces of fruit in a row. Count the pieces. Repeat the activity until the child is able to count the independently. Ask the child to use the wooden knife and cut the pear into two pieces. Explain that pear has been cut into two equally sized pieces or halves. Ask the child to find other fruits that can be cut into halves (the orange, strawberry, lemon and kiwi). 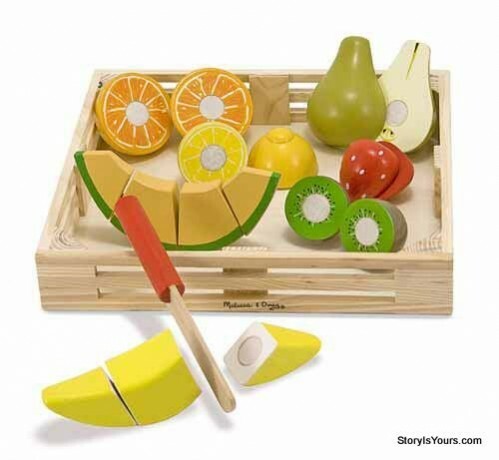 Ask the child to use the wooden knife to cut the banana into three pieces. Explain that the banana has been cut into thirds. Ask the child to use the wooden knife to cut the melon slice into four pieces. Explain that the melon slice has been cut into fourths. Ask the child to mix different pieces of fruit together to create new fruits and name them. For example: a strawberry and a kiwi might make a "kiberry." Place four or more pieces of fruit in front of the child. Let him/her study them before asking the child to close his/her eyes while you remove one piece. Ask the child to identify which piece was removed.